MORE than 240 people who used to live in the Priory Hall apartments in the north Dublin City suburb of Donaghmede are facing a second Christmas out of their homes and in temporary accommodation. The complex was evacuated in October 2011 after failings in fire and safety regulations led to the complex being immediately condemned as a death trap for the men, women and children living there. Resident NIALL O’REILLY gave An Phoblacht’s MARK MOLONEY an exclusive look inside ‘Priory Hell’. PRIORY HALL has now been lying abandoned for more than a year. All attempts at repairs have stopped with structures and paths continuing to crumble. In years gone by, people had scrambled to buy up apartments in the complex. Opposite the fully-refurbished Fr Collins’ Park and a leisure centre, five minutes from Donaghmede Shopping Centre and serviced by bus routes, it appeared an ideal place to buy a home and raise a family. Now, when you turn off the main road, you are met with a security hut, wire fences across the street and signs warning people of the dangers posed by entering the site. It’s a monument to the failures of self-regulation in the building industry. The company behind the development, Coalport Building Company, was ordered to be wound-up by the High Court in February 2011. One of Coalport’s directors was now-bankrupt developer Tom McFeely, a former IRA Hunger Striker and later a member of the League of Communist Republicans. Sinn Féin has been forthright in its condemnation of McFeely, who has betrayed everything Irish republicanism and his comrades stood for by his treatment of the residents of Priory Hall, local Sinn Féin Councillor Mícheál Mac Donncha has repeatedly said. As I arrive on site, Niall is standing and chatting with the security guards at their hut. I’m let through the fence and sign in. Only a week earlier a reporter and photographer for a local paper were refused entry to the site. “It’s like one of those abandoned towns near Chernobyl, isn’t it?” says Niall as we walk down the empty main road beside an overgrowing grass verge. A security guard who accompanies us tries the electronic keypad to gain access to Niall’s apartment block but it doesn’t seem to be working and a key to open it manually has to be found. As we walk up the stairs, Niall points out various faults: damaged banisters, rising damp and mould growing on the ceiling. We walk into the shell of Niall’s and partner Rosaleen’s apartment. It’s a shell. “All our furniture is in a lock-up,” he tells me. There were also major problems with the plumbing, Many of the staff hired for the job weren’t paid and pipes and appliances were left only hand tightened or half-finished. We head out to the rear of the block and see through a skylight that the underground carpark is flooded. 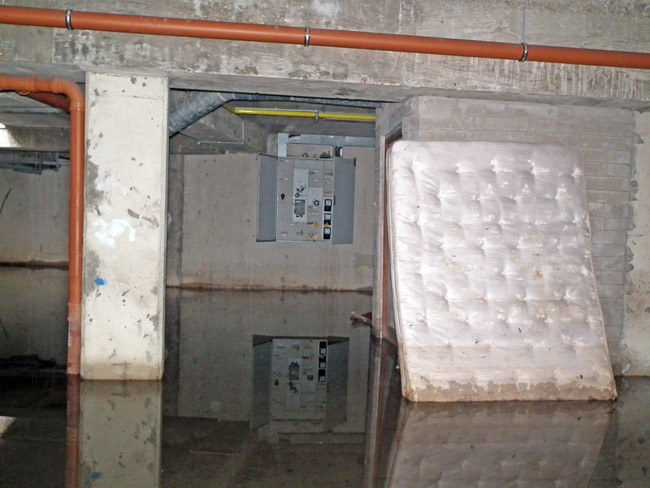 Mattresses and other furniture which residents couldn’t take with them are propped up beside electrical fuseboards along the wall. Watermarks on the plaster inside the staircase show that the water had reached three feet high. On 13 October 2011, the High Court ordered the evacuation of the complex because of fire safety concerns. Fire Officer Donal Casey said that defects in the exterior walls meant that fire could spread through an entire block “within minutes”. So serious was the threat of a fire that Dublin Fire Brigade were directed by the High Court judge to maintain a 24-hour presence for the duration of the evacuation. There was also serious concern that the front facade of the blocks could collapse in high winds they were not secured properly. Even now the security guards park their cars in the centre of the street to avoid bricks and masonry possibly falling from above. Dublin City Council is challenging a court ruling that the Council must cover the cost of temporary accommodation for residents. Many families did not receive a moratorium on their mortgages and are still paying for homes that they cannot live in. They simply will not be able to pay for rent on top of a mortgage. Even those who did obtain a moratorium are still accruing interest. A confidential mediation process between residents, Dublin City Council and the banks is still ongoing. “The actions of Dublin City Council have been questionable the whole way through this. They never even inspected the apartments for their own tenants when they were buying them. It’s just negligence,” says Niall. In April, Taoiseach Enda Kenny was confronted by Priory Hall residents during a jobs launch in nearby Baldoyle Industrial Estate. Kenny empathised with their plight and promised a further meeting. Seven months on and it still hasn’t happened. “It took somebody to step out in front of his car for him to even come and talk to us,” says Niall. The dismissive and insulting attitude of developer Tom McFeely towards residents has caused widespread anger. 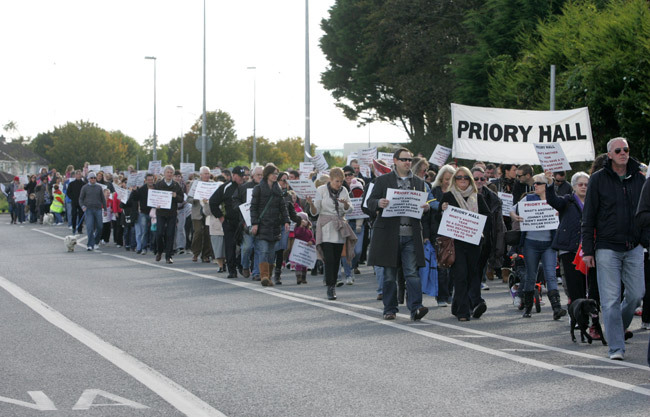 When hundreds marched through Donaghmede to mark one year since the evacuation of Priory Hall, McFeely dismissed the show of public support as ‘just a day out for the kids’. Niall tells An Phoblacht he doesn’t think he will ever be back living in Priory Hall. 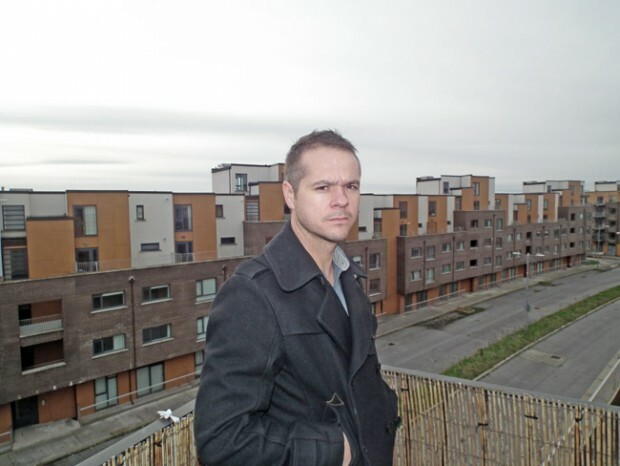 There has been massive community support for the residents in Donaghmede and Niall says some local councillors, such as Micheál MacDonncha of Sinn Féin and Brian McDowell of Labour, have been “outstanding” in working on their behalf. 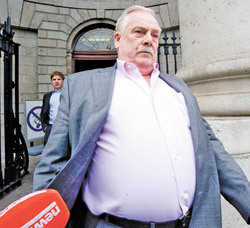 “Since the evacuation, however, other local reps have washed their hands of Priory Hall,” he says. “At the start it was a photo opportunity for them. Their actions have left a lot to be desired.” During a rally to mark 100 days since the evacuation local Fine Gael TD Terence Flanagan was heckled and booed off-stage by furious residents. And Priory Hall residents need natural justice.